It has been a while since I wrote a post specifically about testing, and I ran into an opportunity that I couldn’t resist. I am attending a software test conference, CAST, that is in Toronto, in about a month. I am looking forward to this because there are some good speakers lined up, and I am attending a tutorial that is going to be done by Jerry Weinburg, who if you do not know, has written a whole host of books on various topics that relate in many different ways to testing. Now where the testing part comes in is when I got an e-mail this morning stating that I have officially been signed up for CAST, and can go see what I am signed up for. I decide to click on the link to give the website a little look, and I was very glad I did, because it gave me, as you can seen in the screenshot below, a humourous dose of irony. 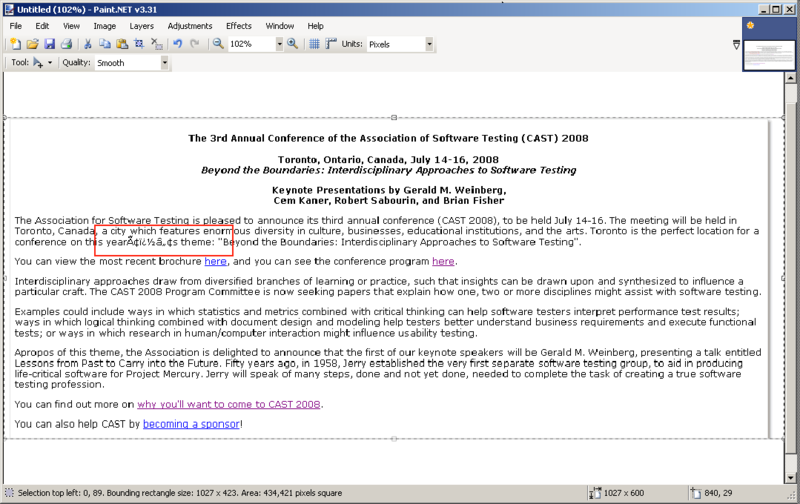 I did notify them of this error before putting up my post, just to give them a little heads up, but I did get a good laugh that there was a bug on a website for a software testing conference! I’m writing a little more about ESX scripting because I had a lot of trouble tracking down some of this information, and if it had been all in one spot I would have saved a lot of time and trouble! I will be going over a few basic commands, as well as a few errors that I found. All of this was done on a ESX 3.5 machine. This all started recently when I needed to reproduce a bug to show that it actually was an ESX specific issue. I learned quite a bit about ESX scripting from this experience, and hopefully some of the knowledge I am about to impart upon the vast interwebs helps someone out! These are all the different commands you can run with vmware-cmd. This in itself is only somewhat useful because for the more detailed commands, such as getconfig and setconfig, it does not tell you what variables to enter. I will go over a few of the ones that I have played with next. Those are some of the simple useful ones, now here are a few that are a little finicky. Soft: VMware tools need to be installed and running, therefore there are many cases when this will not work! Setting or getting a configuration is a bit confusing at first because it asks for a variable, where is this variable coming from!?!? Luckily its actually pretty simple, you can set/getconfig on any of the settings in the .vmx file. There unfortunately is an issue with ESX 3.x ; some of the parameters that you set, only get set if you reset the hostD service by entering: service mgmt-vmware restart . This really is only a workaround as running this command will reset all of the connections that the ESX server has with the VMs, and it does take some time for it to come back up. There you have it, this should be enough info to get you started on some ESX scripting. If you have any questions on how some of these commands work feel free to drop me a comment, and I’ll do my best to help you out. Below are also a few resources that I found helpful, but keep in mind if you are running ESX 3.x some things may work differently! VMdumper is something that apparently does not exist, well according to google at least. But fortunately, I have learned of, and now am sharing some of the usefulness of this little tool in VMware. The main thing that I have used it for is to take a .png screenshot of a virtual machine on that ESX server. This has a whole bevy of usefulness. Specifically for me, I was trying to catch a specific error that was occurring when my VMs were booting in a specific way and that left no trace if itself in any log files, the only way to know it happens is to look at the screen, thus a screenshot was in order! Basically what is happening is that this command is that the list of VMS is piped out and the grep command finds the line that has the desired VMID with the use of the VM’s display name. The first awk command pulls out the whole vmid filed, and the second awk pulls just the vmid number, and finally it is assigned to the variable VMID! The screenshot will be deposited where that VMs .vmx file is located and will be labeled vmdumper.png! There you have it, a screenshot of a running VM from the command line that you can run from a bash shell script! One final time here are the commands you’ll need to run. Hopefully this helps someone out, I know it made my day a lot easier! This is the first time I have posted a sort of How To, or purely information related post, feel free to drop me a line on the formatting or if there is any info that should be included that is not!